Pakistan has blocked a key supply route to US and Nato forces in Afghanistan in order to begin an offensive against militants, officials say. Troops backed by helicopter gunships and tanks began the operation in the Khyber Pass area early on Tuesday. There has been a spate of hijackings and attacks on vehicles carrying crucial overland supplies to US and Nato troops fighting the Taleban. The route from the port city of Karachi is the major source. About 70%-80% of supplies for international forces in Afghanistan come through Pakistan despite efforts to develop alternative routes. The leading administrator in Khyber, Tariq Hayat, said: "Supplies to Nato forces will remain suspended until we clear the area of militants and outlaws who have gone out of control." Speaking from Peshawar, capital of North West Frontier Province, Mr Hayat said a curfew had been imposed and the main road to the Afghan border was closed. The operation was taking place in the Jamrud district, he said, and would continue until the route to Kabul was fully secured. The military had identified 26 militant sites to target, Mr Hayat said. He said the local Kukikhel tribe had been found to be harbouring Taleban militants. The main border crossing between Pakistan and Afghanistan at Torkham has also been closed. Mr Hayat said the operation would be extended to other areas of Khyber if necessary. Capt Mark Windsor, of Nato's International Security Assistance Force, told the BBC it was aware of the "temporary" closure. "It's in the best interests of clearing that area of people who have been disrupting supplies, or attempting to disrupt our supplies, over the last few weeks," he said. The BBC's Charles Haviland in Islamabad says attention is now shifting back to the troubles in the Afghan border region, after a month of heightened tensions with India after the attacks on Mumbai. 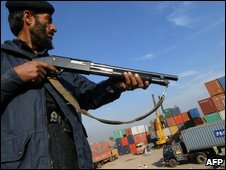 Since September the Taleban in Pakistan have targeted vehicles carrying supplies for foreign forces in Afghanistan. They have hijacked lorries, stolen their cargo and kidnapped their drivers. Some lorry drivers recently suspended organised convoys to Afghanistan due to the worsening security although some supplies did continue under heavy paramilitary guard. Recently thousands of protesters turned out in Pakistan's city of Peshawar to demand an end to the supply route and to US strikes into Pakistan. There have been a number of missile attacks by pilotless US drones on targets inside Pakistan, which the government in Islamabad has strongly opposed.